Paragliding is a sport born at the end of the 20th century by the ingenuity of mountaineers who wanted to fly down by a parachute from the peaks that had ascended. The wing, and sometimes the whole team, is named after the same name, paragliding. The technical definition would look something like this: flexible light glider. Glider because it does not have engine and flexible because there are no rigid parts that make up the wing, so it can be transported in the trunk of a car. The weight of all equipment is around 25-30 kg, although there are mountain equipment with a mass of about 8 kg. 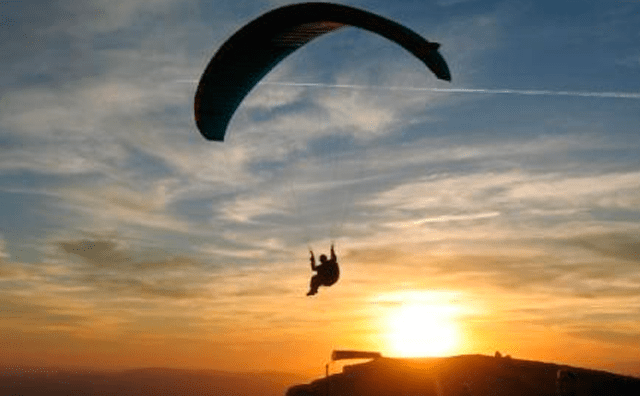 The pilot and occasionally the paragliding passenger will be equipped with mandatory safety equipment, helmets and emergency parachutes, and with various electronic instruments: variometer or altivarium, GPS and radio equipment. Being a type of flexible wing, the turbulence and especially the shear can produce folds that deform the wing profile, thus losing part of its capacity of support and entering different flight configurations: asymmetrical or frontal folds, autorrotation, auger, etc. . If the incident occurs at a sufficient height, it will normally be possible to return to the natural flight configuration, but if this is not the case, a very basic parachute is used as a last resort for an emergency case that rarely occurs. One part of the training of a paraglider pilot is just learning to control paragliding in flight incidents. This type of course is called SIV (Flight Incident Simulation). In this course the pilot will learn to master paragliding in the face of an incident, to make useful maneuvers (drills, losses) and to use the emergency parachute correctly. These types of courses are performed on the water, with the presence of a rescue boat for safety in case of having to use the emergency parachute. The maximum and minimum relative speed range for an intermediate paraglider model is: Maximum speed: 50 kilometers per hour. Minimum speed: 24 km / h. A competition paraglider can surpass 60 kilometers / hour and a glide ratio, or “fineness” of 10: 1, ie, that for every 10 meters relative of advancing air descends one (we must think that being in the air , The speed in this case will always be relative to the strength and direction of the wind, and not to confuse with the actual speed to land GPS). It is about being able to take off, fly and land with a wing by the pilot’s own means, that is, on foot. The ideal would be from a slope not very sloping and facing a moderate wind of about 10-20 km / h, or less even if it is intended to fly near the coast, since the air will have a higher density there due to atmospheric pressures And higher relative humidities. Then the pilot will sit comfortably in a chair or harness, attached to the belts by two carabiners. The form of flight is pendular, which means that the pilot has direct control in only two of the three planes of flight: warping (with the weight of the pilot and the brakes) and pitching (with both brakes simultaneously and with the accelerator) ; The yaw, therefore, lacking a tail, is beyond the control of the pilot. Another possible way for the paraglider to take off is to do it with fixed traction lathe or a mechanical unwinder that an operator controls by giving tension to a cable. It is hooked onto the harness by means of a quick release system, which the pilot will actuate when the turner instructs it. It is a typical type of flight of plains (especially in deserts, where the highest heights are reached) and here the duration of the flight depends on the skill of the pilot to get elevated as much as possible and then to find currents of ascending air. We can also see paramotors when the same wing is attached to a chair or harness with a petrol or electric explosion engine and a propeller of two or three blades that propulses the entire system at will of the pilot. Although the wings of both aircraft are the same or very similar, weather conditions, flight and non-engine flight techniques, and environmental impact differ widely. The science of sailing and, consequently, paragliding is based on thermal currents and dynamic currents. The first are produced by heating a mass of air by conduction, ie by the contact of air on a floor heated by the sun’s rays. This mass of air expands by raising its temperature and is lighter than the surrounding air, so that once the resistance created by the same air viscosity has been overcome, it begins to rise in the form of bubbles or as more or less cyclical vertical currents . This hot air rise, called thermal, is the engine used by all glider aircraft. In the second case, the wind upward direction is used to save some obstacle, a technique almost always reserved for some shorebirds and paragliders. In thermal flight, the skill is to center the ascending channel well to obtain the maximum speed of ascent but losing the least possible height in the turn. But before that we must find those thermal currents; May be drifting from the more arid zones of the terrain, on the slopes with more incidence of the sun’s rays, to leeward of obstacles, and in addition the clouds of convection or clusters mark them as the lenticular clouds show high speeds of the wind Or you can know the direction of the wind by the shape of the clouds. The ancestors produced by a storm cloud or cumulonimbos are so large that they overflow the aircraft and constitute a danger for the pilot, both for the enormous altitude at which they rise (sometimes 10,000 meters), for the disorientation that is Suffers because of a zero visibility, as well as by the turbulences that may exist within it. The restitution is a thermal flight that occurs at dusk, when large masses, especially rocks and arid lands, gradually return to the atmosphere the heat stored during hot days and with little wind, generating smooth but huge ancestry. This action is increased in the valleys by fresh currents, or katabatic wind, that descend along the slopes after sunset. The dynamic flight is made by moving in front of an obstacle in front of the wind, as a surfer slides by a wave, as this wind, when climbing up the slopes, provides a mass of sustaining air. The mountain wave has the same effect, with the exception of being produced by strong meteorological winds, that when ascending and descending by orographic accidents produce ances and descendants, as well as very turbulent zones, also denominated “rotores”. The thermodynamic flight is only to take advantage of the convergence of breezes of different orientation that produces an elongated ascending zone and generally crowned by clouds of convection or cumulus. This convergence can be derived by the meteorological wind existing in higher layers of the atmosphere and they are authentic freeways freeways. They have reached a distance of 400 kilometers in a straight line thanks to this phenomenon. In many countries this activity is not regulated, and the use of defective equipment, the lack of security complements or this activity without a previous training course with trained personnel, cause accidents that could be avoided if the sport was taken with responsibility. Good training and a bit of good sense is the basis for this sport to be safe.